Responds with address, VAT number and contact information about the business. Please note that Country in address is not updatable. Business country will be always Spain. Business name (maximum of 255 characters). Telephone number (maximum of 255 characters). Via Type ID of the address. Via Name of the address (maximum of 150 characters). Via Number of the address (maximum of 150 characters). Floor of the address (maximum of 5 characters). Stair case of the address (maximum of 10 characters). Door of the address (maximum of 10 characters). City / Township of the address (maximum of 60 characters). Province of the address (maximum of 60 characters). Postal Code of the address (maximum of 10 characters). VAT number identifier (maximum 255 characters). Identifier Type ID of this VAT number. "name": "NIF/IVA (NIF Operador intracomunitario)"
Responds with information about the possible identifier types. The ID of the Identifier Type. The name of the Identifier Type. Responds with all Identifier Types. Responds with the Identifier Type for the ID requested. Responds with information about the possible via types. The ID of the Via Type. The name of the Via Type. The code of the Via Type. Responds with all Via Types. Responds with the Via Type for the ID requested. This refers to the bank accounts in Sage One. This resource allows you to read, add, update and delete bank accounts in Sage One. Delete the specified Bank Account. The via type for the Address. The via name for the address. The via number for the address. Only valid for the type Customer (not for Suppliers). Set to true if the Customer must invoice with Equivalence Surcharge (Recargo de Equivalencia). By default is false. Only valid for the type Supplier. Set to true if the Supplier must invoice with Cash Criteria, when Business is under Cash Criteria Taxation, by default is true. Only valid for the type Customer. Set to true if the Customer is excluded to invoice with Cash Criteria, when Business is not under Cash Criteria Taxation, by default is false. VAT number for the contact. Use this to limit the response to instances created, updated, or deleted since a given date (format: YYYY-MM-DDT(+|-)hh:mm ) or date-time (format: YYYY-MM-DDThh:mm:ss(+|-)hh:mm ). For example, /accounts/v2/contacts?updated_or_created_since=2014-06-25 or /accounts/v2/contacts?updated_or_created_since=2014-06-25T10:30:00-04:00. The timezone offset ( (+|-)hh:mm ) defaults to UTC if it is not provided. Please note that client data are stored in Eastern Time (US & Canada) on the servers so please set the Eastern Time offset to get correct response. Contact's business name. Business name has a maximum of 50 characters. Note: Only one of contact[company] or contact[name] is required. Contact’s email address. Maximun 100 characters. Email must be valid. Contact’s name. Contact name has a maximum of 50 characters. Note: Only one of contact[name] or contact[company] is required. Additional notes about the contact. Maximun 500 characters. Only valid for the type Customer (not for Suppliers). Set to true if the Customer must invoice with Equivalence Surcharge. By default is false. Identification number for the contact. Responds with information about the possible corrective reason. The ID of the Corrective Reason. The name of the Corrective Reason. Responds with all Corrective Reasons. Responds with the Corrective Reason for the ID requested. The identifier of the Tax Code. This refers to the expenses in Sage One. 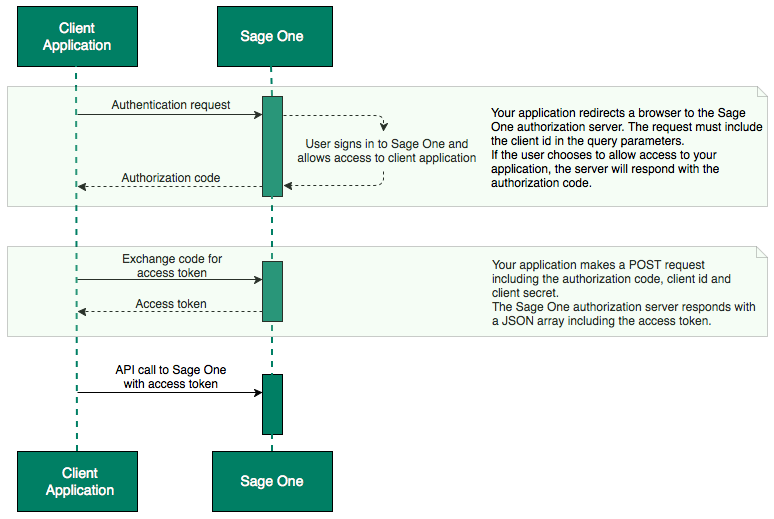 This resource allows you to read, add, update and delete expense transactions in Sage One. The payment method of the Expense transaction. The identifier of the Ledger Account Type. Not available in Sage One Spain. The identifier of the Tax Rate. The IRPF rate percentage for the expenditure. The IRPF amount of the expenditure. The deductible percentage for the expenditure. The deductible amount for the expenditure. You can limit the response to instances created within a date range. You must supply both the from_date and the to_date. The date format can be either YYYY-MM-DD or DD/MM/YYYY. However, if using DD/MM/YYYY, another URL parameter classic_dates=true has to be included. Use this to limit the response to instances created, updated, or deleted since a given date (format: YYYY-MM-DDT(+|-)hh:mm ) or date-time (format: YYYY-MM-DDThh:mm:ss(+|-)hh:mm ). For example, /accounts/v2/expenses?updated_or_created_since=2014-06-25 or /accounts/v2/expenses?updated_or_created_since=2014-06-25T10:30:00-04:00. The timezone offset ( (+|-)hh:mm ) defaults to UTC if it is not provided. Please note that client data are stored in Eastern Time (US & Canada) on the servers so please set the Eastern Time offset to get correct response. The reference of the expense (maximum of 255 characters). The payment method of the Income transaction. The category of the Income transaction. The Contact's ID associated with this Income transaction. The Contact's name associated with this Income transaction. The reference of the Income transaction. The bank account which the Income transaction is paid to. The total amount of the Income transaction. The gross total of the Income transaction. The IRPF tax percentage of the Income transaction. The IRPF tax amount of the Income transaction. The timestamp when the Income transaction was deleted. You can limit the response to instances created in a date range. You must supply both the from_date and the to_date. The date format can be either YYYY-MM-DD or DD/MM/YYYY, but another URL parameter classic_dates=true has to be included if using DD/MM/YYYY. Use this to limit the response to instances created, updated, or deleted since a given date (format: YYYY-MM-DDT(+|-)hh:mm ) or date-time (format: YYYY-MM-DDThh:mm:ss(+|-)hh:mm ). For example, /accounts/v2/incomes?updated_or_created_since=2014-06-25 or /accounts/v2/incomes?updated_or_created_since=2014-06-25T10:30:00-04:00. The timezone offset ( (+|-)hh:mm ) defaults to UTC if it is not provided. Please note that client data are stored in Eastern Time (US & Canada) on the servers so please set the Eastern Time offset to get correct response. Not used in Spain, will always return null. Default percentage for IRPF taxes in operations. Is this Business under Cash Criteria VAT taxation? Use this to limit the response to instances created, updated, or deleted since a given date (format: YYYY-MM-DDT(+|-)hh:mm ) or date-time (format: YYYY-MM-DDThh:mm:ss(+|-)hh:mm ). For example, /accounts/v2/products?updated_or_created_since=2014-06-25 or /accounts/v2/products?updated_or_created_since=2014-06-25T10:30:00-04:00. The timezone offset ( (+|-)hh:mm ) defaults to UTC if it is not provided. Please note that client data are stored in Eastern Time (US & Canada) on the servers so please set the Eastern Time offset to get correct response. The purchase invoice corrective mark. The tax rate percentage of the line item. vat amount of the line. This value must be calculated by the developers as ((unit_price * quantity) * (100 - discount_percentage) ) * tax_rate_percentage. The discount percentage on the line item, between 0 to 100,00. By default it will be 0. The discount amount on the line item of the Purchase Invoice. The payments made for the Purchase Invoice. The IRPF percentage of the Purchase Invoice, between 0 to 100. By default it will be 0. The IRPF amount of the Purchase Invoice. Use this to limit the response to instances created, updated, or deleted since a given date (format: YYYY-MM-DDT(+|-)hh:mm ) or date-time (format: YYYY-MM-DDThh:mm:ss(+|-)hh:mm ). For example, /accounts/v2/purchase_invoices?updated_or_created_since=2014-06-25 or /accounts/v2/purchase_invoices?updated_or_created_since=2014-06-25T10:30:00-04:00. The timezone offset ( (+|-)hh:mm ) defaults to UTC if it is not provided. Please note that client data are stored in Eastern Time (US & Canada) on the servers so please set the Eastern Time offset to get correct response. The ID of the contact associated with the purchase invoice. The purchase invoice date in the format YYYY-MM-DD. The payment due date of the purchase invoice, in the format YYYY-MM-DD; if not set, it defaults to today's date plus payment terms for customers (days) as set in Invoice settings. The reference of the purchase invoice (maximum of 255 characters). The notes for the purchase invoice (maximum of 1000 characters). The deductible percentage for the Purchase Invoice. By default it will be 100,00. The line items of the purchase invoice. The description of the purchase invoice line item (maximum of 200 characters). The ledger account (category) ID of the purchase invoice line item. The ledger account type has to be 'DIRECT_EXPENSES' for purchase invoices. The number of units on the specified purchase invoice line item (maximum value of 99999999). The unit cost of the purchase invoice line item (maximum value of 99999999). The ID of the contact to be associated with the purchase invoice. The ID of the purchase_invoice_line_item; required for UPDATE and DELETE line item. The description of the purchase invoice line item (maximum of 200 characters); required for CREATE line item (when line item ID isn't specified). The number of units on the specified purchase invoice line item (maximum value of 99999999); required for CREATE line item (when line item ID isn't specified). The unit cost of the purchase invoice line item (maximum value of 99999999); required for CREATE line item (when line item ID isn't specified). The reason the invoice is being voided. If not supplied, this defaults to ‘Temporary Reason’. The amount of the payment (maximum value of 99999999); default to the invoice balance if not provided. Payment amount must be greater than 0 and equal to or less than the outstanding amount. The date when the payment was made, in the format YYYY-MM-DD; default to today's date if not provided. The ID of the bank account which the payment was made from; default to Checking Account if not provided. The reference of the purchase invoice payment (maximum of 255 characters). Update the specified purchase invoice payment. The amount of the payment, to a maximum value of 99999999; payment amount must be greater than 0 and equal to or less than the outstanding amount. This resource allows you to read, add, update and delete sales invoices and payments in Sage One. The ID of the contact associated with the invoice. The status of the sales invoice. The payment due date of the invoice, in the format yyyy-mm-dd. If not set, it defaults to today's date plus payment terms for customers (days) as set in Invoice settings. The delivery address (maximum of 500 characters). Set to 1 if the delivery address is the same as the main address supplied. The terms and conditions associated with the invoice (maximum of 1000 characters). Any additional information (maximum of 1000 characters). The line items for the Sales Invoice. The number of units on the line item (maximum value of 99999999). The description of the line item (maximum of 200 characters). The product code associated with the line item (maximum 255 characters). The unit cost of the line item (maximum value of 99999999). Nominal Code (maximum of 11 characters). Ledger Account Type description (maximum of 255 charaters). The discount percentage on the line item, between 0 to 100. The equivalence surcharge rate percentage for the line item. The payments made for the Sales Invoice. For corrective invoices these can be negative. Payment amount. Payment amount must be greater than 0 and less than or equal to the outstanding amount. Corrective invoices can be negative or positive (between 0 and the outstanding amount). The IRPF amount of the Sales Invoice. The ID of the Corrective Reason for this transaction. Use this to limit the response to instances created, updated, or deleted since a given date (format: YYYY-MM-DDT(+|-)hh:mm ) or date-time (format: YYYY-MM-DDThh:mm:ss(+|-)hh:mm ). For example, /accounts/v2/sales_invoices?updated_or_created_since=2014-06-25 or /accounts/v2/sales_invoices?updated_or_created_since=2014-06-25T10:30:00-04:00. The timezone offset ( (+|-)hh:mm ) defaults to UTC if it is not provided. Please note that client data are stored in Eastern Time (US & Canada) on the servers so please set the Eastern Time offset to get correct response.